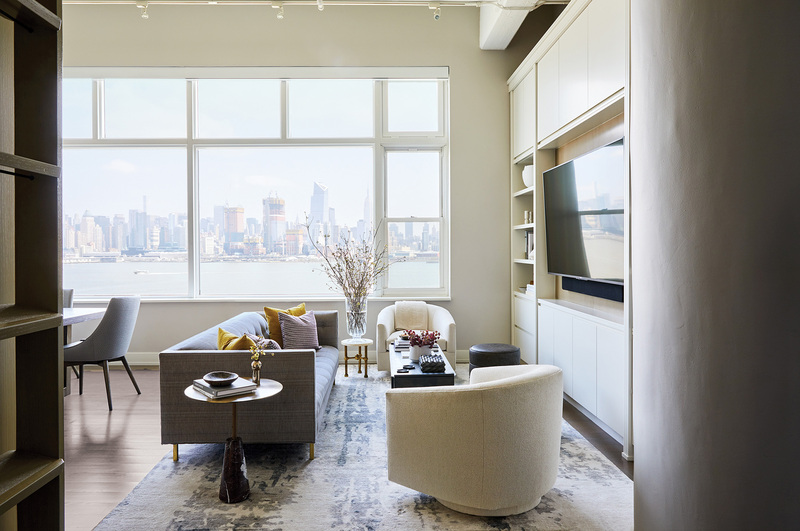 Joan Enger faced several challenges when she designed a Hoboken, New Jersey, condominium for a young family, not least of which was its relatively small size. The 1,700-square-foot space needed to accommodate the varied requirements of the couple and their two children. 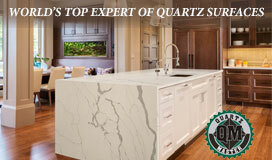 Fortunately, the designer was brought into the project during its earliest stages. “We were hired alongside the architect months before demolition would begin—the ideal scenario,” she says. 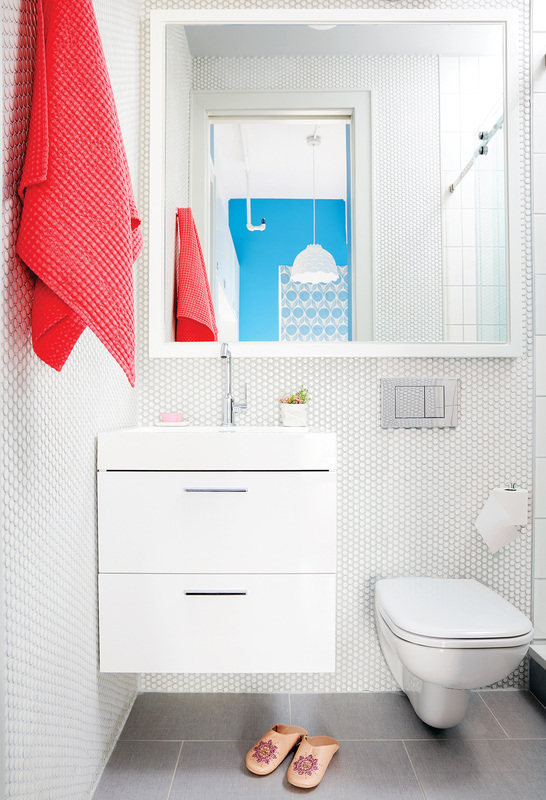 A “floating” vanity tucked into a corner helps this small bathroom appear larger. The result is a living space that is composed and tranquil, with enough color to keep it interesting. In the kitchen, unembellished cabinetry creates an airy feel, while a quartzite waterfall countertop on the island adds a bit of heft. Industrial pendants and stainless steel touches bring edginess to the soft surroundings. Enger used the generous vertical height to create more storage and included a “library ladder” for accessibility. 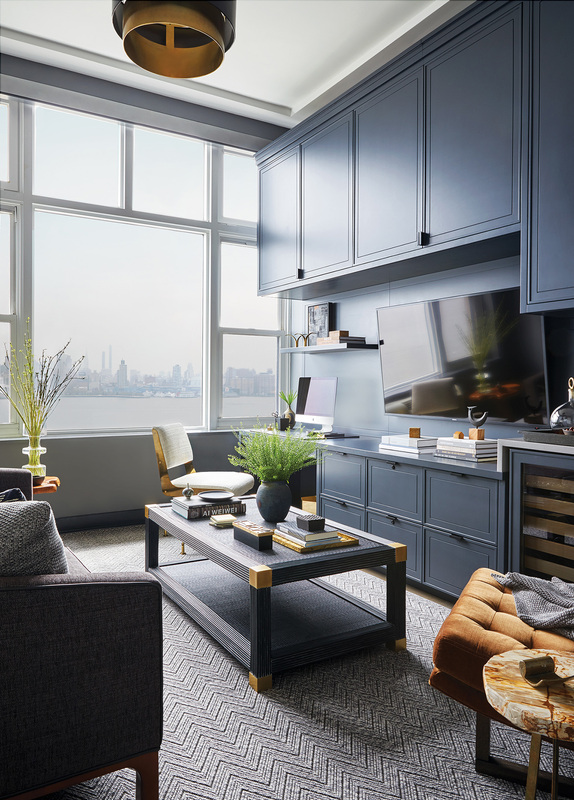 The living room is awash in subtle grays and white, but, Enger says, she made sure to acknowledge the husband’s request for color. 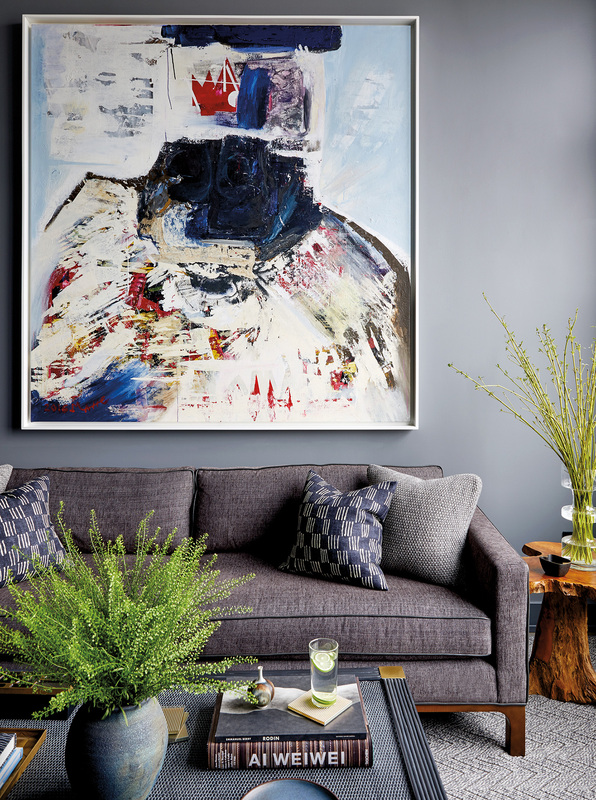 “The citron George Spencer velvet pillows in the living room were all for him!” The den, done in a “moody blue with dramatic artwork,” also was created with the husband in mind. 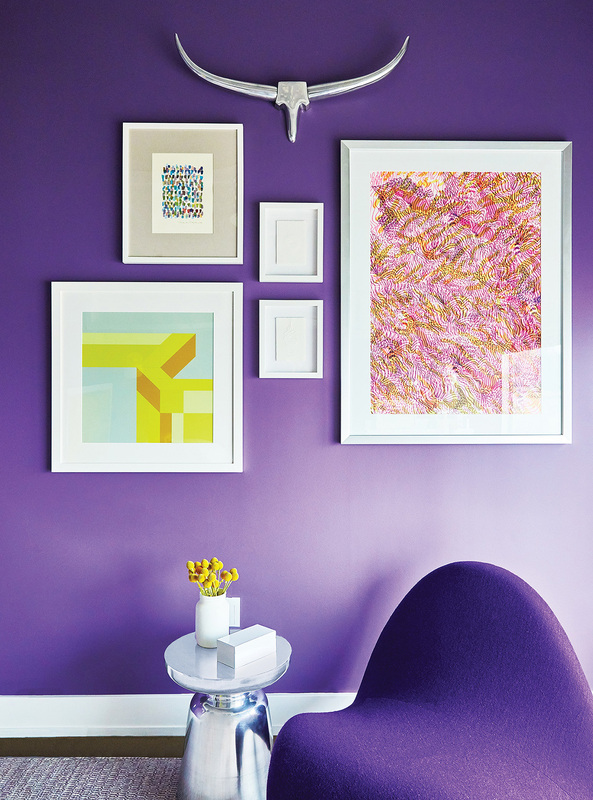 The kids’ rooms are based on a foundation of bold color—one in a vivid blue with a pink carpet and artwork in a variety of brilliant hues, the other a study in violet with citrus-y accents. But even these colorful spaces have a soothing simplicity the wife can appreciate. 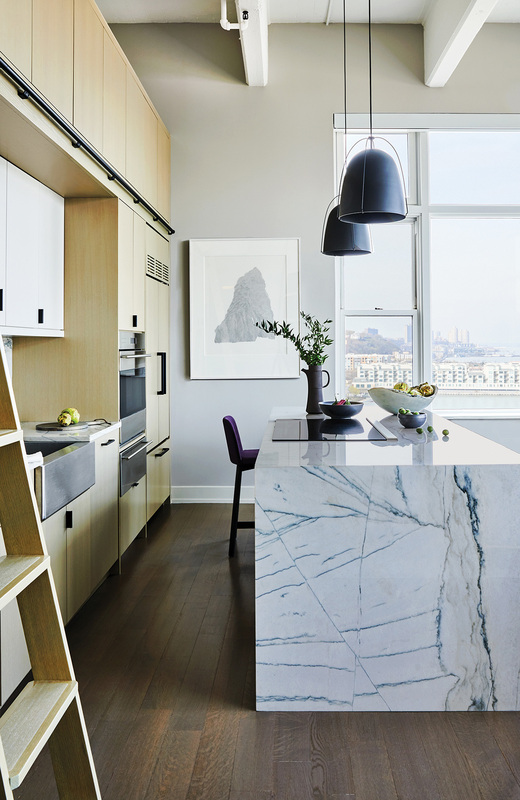 Unfussy furniture and unadorned cabinetry maintain the equilibrium against the bright walls. 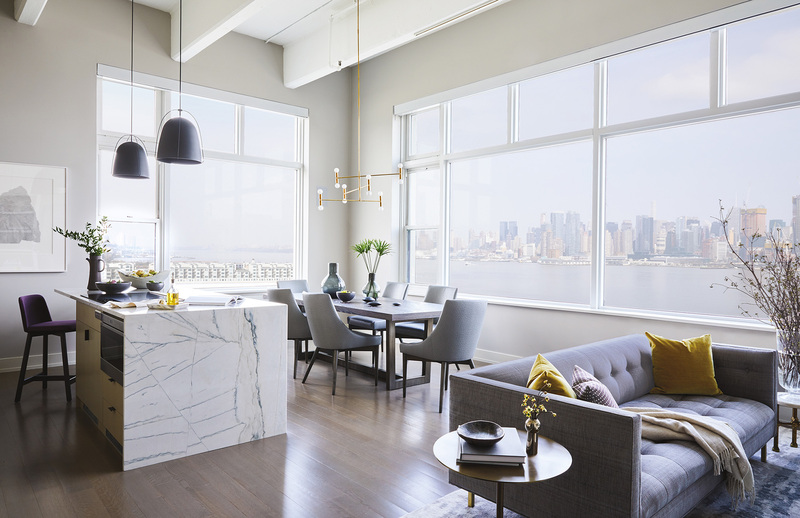 Overall: design, Joan Enger of J. Patryce Design in Hoboken; architect, Jensen C. Vasil Architect, PC, in Hoboken; millwork, NR Wood Design Corp. in Brooklyn. Den: wall color, “Steel Wool” by Benjamin Moore; “Chipley” sofa in slate colorway, Stark Carpet in New York City; “Nora” sofa, Mitchell Gold+Bob Williams in Paramus; custom throw pillows, “Matchstick” from Claremont Furnishing Fabrics Co. in New York City and “Orino” from Sferra Linens in Edison; “Gregory” coffee table, Palecek Furniture; large oil painting over sofa, Mane Sakic in Jersey City; “Griffin” lounge chair, Lawson-Fenning in Los Angeles; desk chair, Bungalow 5 in Saddle Brook upholstered with velvet from George Spencer Designs through Claremont Furnishings Fabrics Co. Living Room: wall color, “Nimbus” by Benjamin Moore; wool and silk carpet, ABC Carpet&Home in New York City; “Trousdale” sofa, Lawson-Fenning with fabric from Elizabeth Dow through Holland&Sherry; vintage Milo Baughman chairs upholstered in “Nature Song/Tusk” fabric from Holly Hunt in New York City; custom throw pillows fabric, George Spencer Designs through Claremont Furnishings Fabrics Co.; “Jacques” coffee table, Julian Chichester in High Point, North Carolina; round marble and bronze side table, 1stdibs. Kitchen: wall color, “Nimbus” by Benjamin Moore; “Hailey” pendant lights, Rejuvenation in Portland, Oregon; appliances, Sub-Zero and Wolf; sink, Kohler Co.; stool at counter, Blu Dot in New City; dining area table, Robert James Collection in Chula Vista, California. 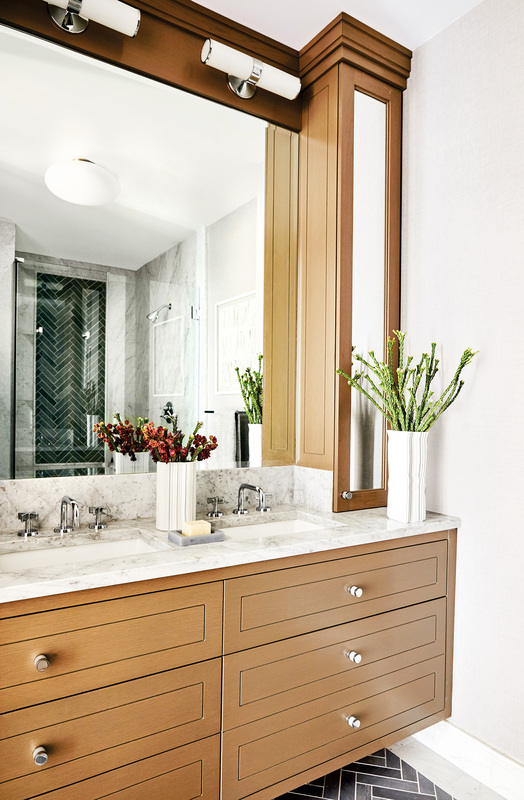 Master Bathroom: wall covering, Holland&Sherry; knurled nickel cabinet hardware, Alexander Marchant in Austin, Texas; “Sutton” sconces, Restoration Hardware; faucets and lav sets, Watermark Designs in Brooklyn, New York. Purple Bedroom: wall color, “Pinot Grigio Grape” by Benjamin Moore; custom window treatment fabric, “Bars–Plum” by Holly Hunt; “Jared” light fixture, Arteriors Home in Carrollton, Texas; desk chair, Overstock.com; desk chair seat fabric, Designers Guild in New York City; bedding, Serena & Lily in Summit; “Tongue” lounge chair, Wayfair; side table, West Elm; art, Tappan in Los Angeles, Society6 and Etsy. Kids’ Bathroom: “Savoy” penny tile, Ann Sacks; vanity, Lada Corp.; faucet and lav set, Crosswater London (formerly Ammara Designs) in Milford, Massachusetts; porcelain floor tile, Marble America Corp. in New Rochelle, New York. Blue Bedroom: wall color, “Poolside” by Benjamin Moore; ceiling light fixture, Hive Modern in Portland, Oregon; sconces over bed, School House Electric in Portland, Oregon; bedding, Serena & Lily; throw pillows, ABC Carpet & Home; desk/play table, custom white melamine top with base from Land of Nod; desk chairs, Design Within Reach; custom window treatment fabric, “Suvi” from Romo Inc.